Revolutionary Superior New Live Skin Care System Brings Life and Beauty Back to Your Skin…Without ANY Chemicals. "Botanical Splash” uses a rare combination of live fruit, nut and plant extracts to feed your skin cells and promote youthful, moist, beautiful glowing skin. The real difference in Botanical Splash is that unlike the many skin care products you probably already have on your bathroom shelf, our product is NOT PETROLEUM BASED. It absorbs quickly into your skin and begins feeding the skin cells what they naturally need. 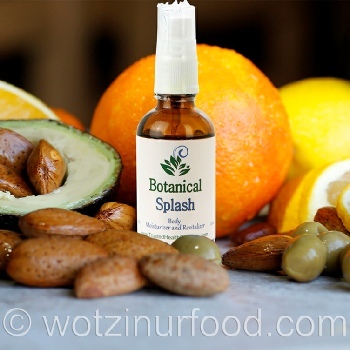 Botanical Splash Ingredients: 100% Pure Botanical oils of almond, orange, lemon, avocado and olive. APPLY – Every day (once or twice a day) place 2-3 drops on each cheek and use fingers to smooth evenly into skin. Your skin will recognize Botanical Splash as food and therefore will be thirsty for it initially. You may use more than 2-3 drops, however your skin will repair itself to the point that it needs less of the formula to see the same results. Do not rub in. DETOX - Your body is probably used to name-brand products made from creams, chemicals, and other toxic ingredients that give your skin results, but by shocking your skin into submission. Botanical Splash takes about 30 days to detox your skin from these ingredients so that your skin can thrive naturally. Results vary for each person. THRIVE - Your skin’s natural beauty will start to shine through after about 30 days of regular use. Botanical Splash will take the place of anti-aging creams, firming creams, exfoliators, moisturizers, day or night creams, makeup removers, body lotions, etc.